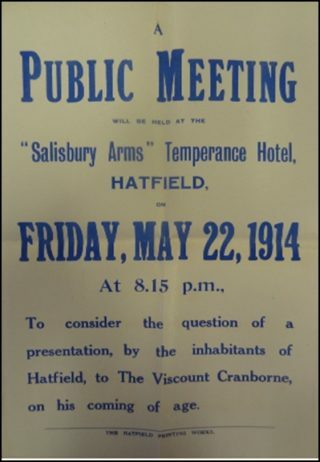 Up to the outbreak of war, the people of Hatfield were looking forward to celebrating the coming of age of the Viscount Cranborne in August 1914. Discussions between the Hatfield Parish Council and the Herts County Council were organized, to decide what form the presentation would take and how monies were to be raised to pay for the present. Two meetings took place in May one at Hatfield,where the meeting unanimously decided to invite tenants, friends, and neighbours, of the Marquis of Salisbury to subscribe to a fund to have a portrait painted of the Viscount (as was the case with his father). The other meeting organized by Sir Charles Longmore, Clerk to the Herts County Council, held at the County Council offices. A further meeting was held at High Holborn on the 7th July 1914, chaired by Lord Clarendon, where it was agreed to ask Mr Arthur Cope (later to become Sir Arthur Cope R.A) to paint a half length portrait of the Viscount, for a fee of £525. Sadly due to the outbreak of the war, the portrait and celebrations were cancelled. Subscriptions continued to be collected up to November 1914, the amount donated by the people of Hatfield was £75 16s 7p, (value today around £5000) a substantial sum, showing the affection the Hatfield people had for the Salisbury family. 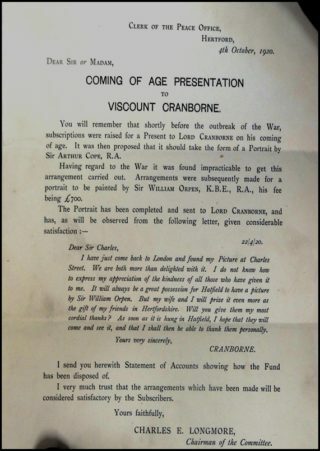 The Viscount, later to become Lord Cranborne, survived the war. 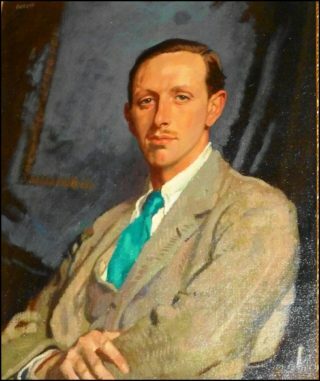 The presentation of the portrait took place in 1920; the artist commissioned to paint the portrait was now Sir William Orpen K.B.E. R.A. (one of the official war artists). A fee of £700 was paid. The Painting Presented upon the occasion of his coming of age to Robert Arthur Cecil, 5th MARQUESS OF SALISBURY, by his Hertfordshire friends and neighbours. Painted by Sir William Orpen R.A. 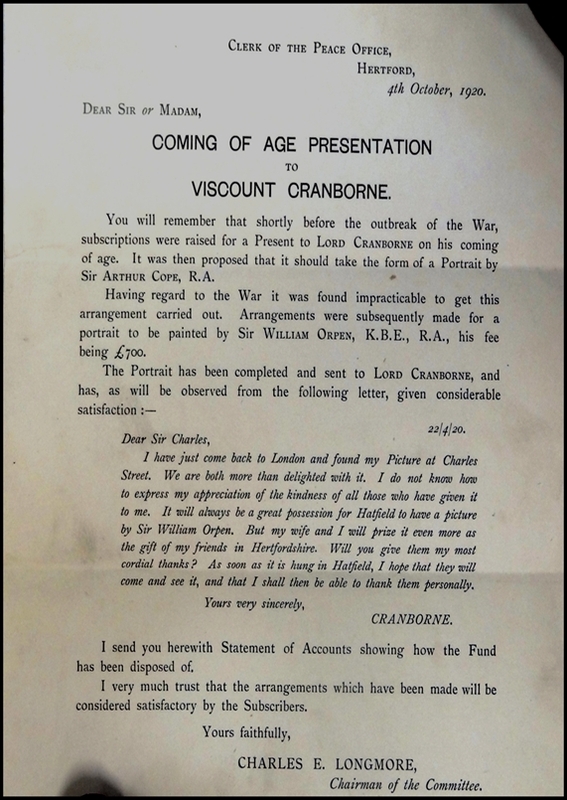 The letter from Sir Charles Longmore in 1920 finalizing the accounts, includes the reply from the now Lord Cranborne on receiving the portrait. This page was added on 04/03/2013.